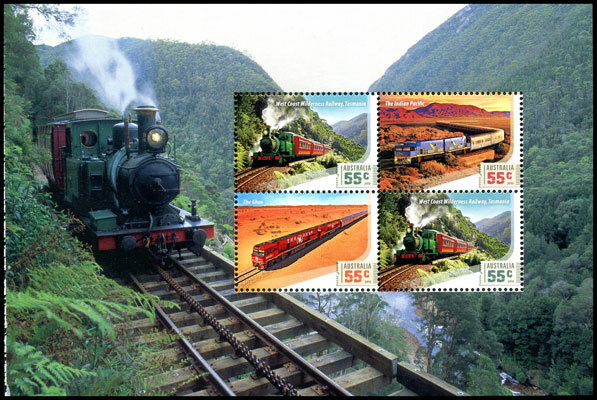 Stamps featuring trains/railways are a popular thematic, and this issue is sure to appeal. 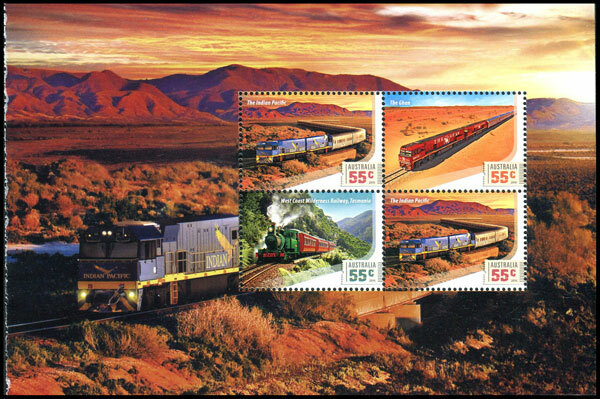 Two of Australia's longest rail journeys, the Indian Pacific and the Ghan are shown on the 55c stamps, along with the West Coast Wilderness Railway in Tasmania. 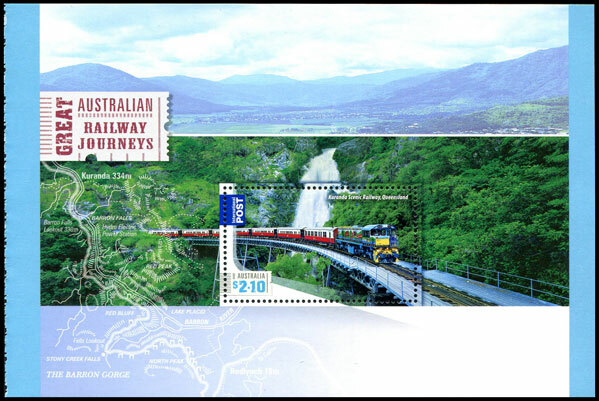 The larger $2.10 stamp features the Kuranda Scenic Railway in Queensland. Collectors might be excused for thinking that some of the designs look familiar. 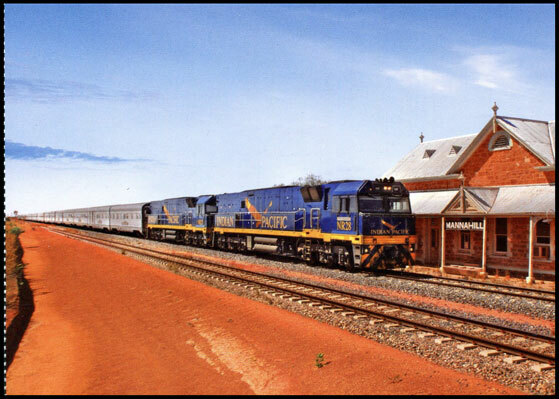 The Ghan has appeared twice before, in 1993 in its green and gold livery, and in 2004 in its current red livery celebrating the opening of the Darwin to Alice Springs section of the line. 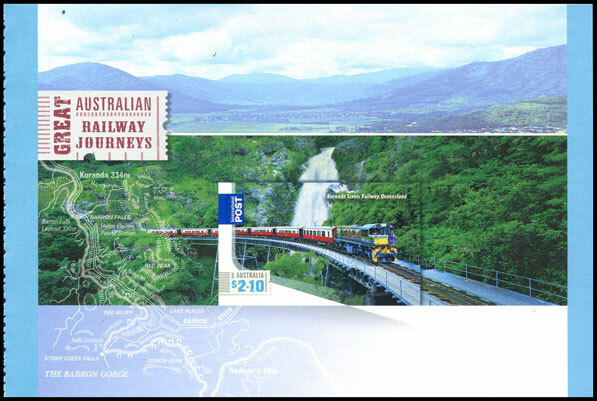 Even more familiar is the Kuranda Scenic Railway stamp, with an almost identical scene shown on the 45c stamp of 1993. 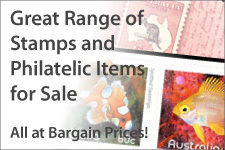 The issue consists of three 55c stamps and a $2.10 stamp. 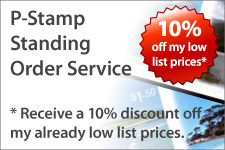 Each gummed stamp was issued in separate sheets. 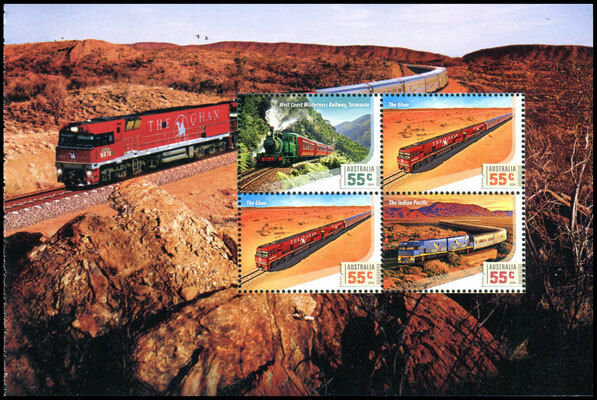 Astute collectors might notice that the illustrations of the stamp pack and first day cover in Stamp Bulletin 304 showed a se-tenant strip of three 55c stamps. 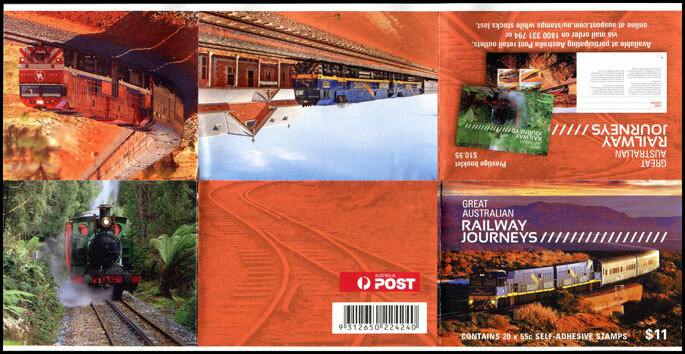 The same illustrations were used on Australia Post's webshop. 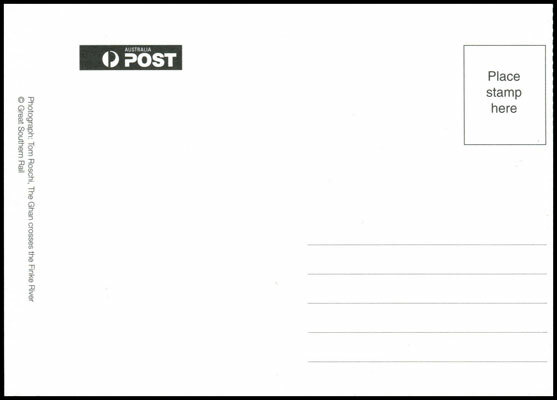 Australia Post has confirmed that no 55c stamps were printed in se-tenant strips. Another surprise was the sheet layout of both the 55c and $2.10 stamps. 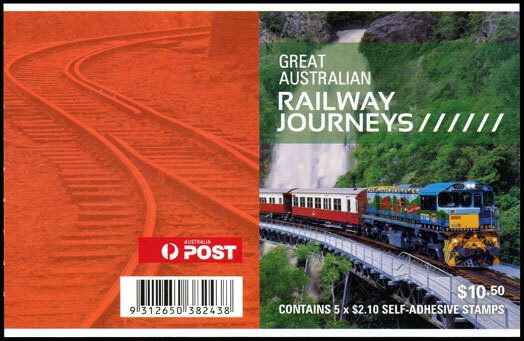 It is odd that Australia Post decided not to include a gutter design in the 55c gutters, despite the immense popularity of trains as a thematic topic! Even more surprising was discovering the $2.10 stamp has a gutter strip too! 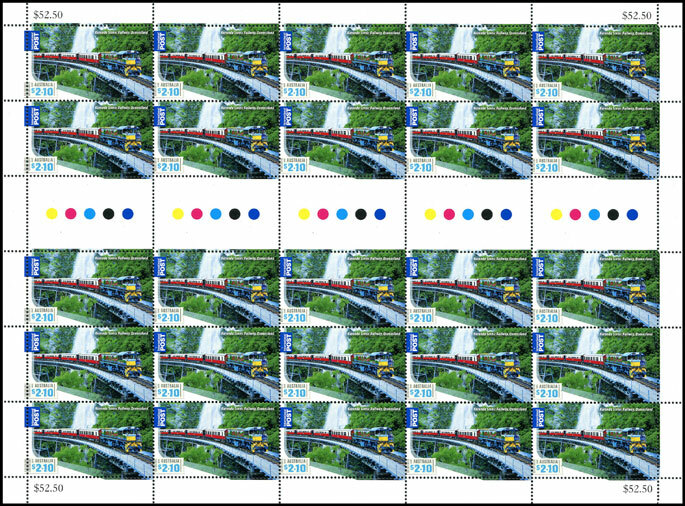 Since the 1990s all 50 mm x 30 mm sized stamps were printed in sheets of 50 with no gutter. The gutter has been printed between the second and third row of the stamps - a rather odd position given gutters usually split the sheet into two equal panes. 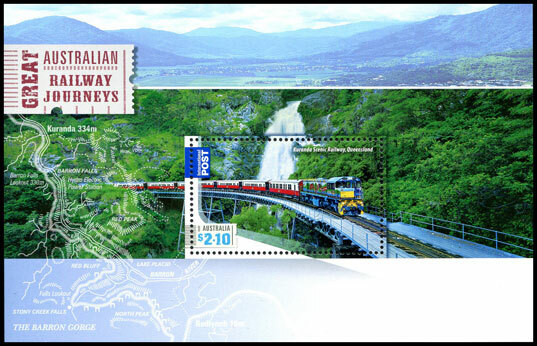 The $2.10 stamp also appears in a miniature sheet, with the margin continuing the design of the stamp. Miniature sheets used for first day covers have been trimmed to 85 mm in height. These are not listed as they can be manufactured. A prestige booklet was also released with this issue. Three panes contain unique blocks of four with the other pane including an enlarged version of the miniature sheet. 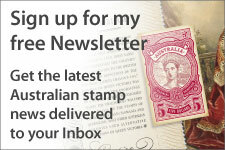 A limited edition imperforate prestige booklet is being released in support of Australia 2013 (see www.australia2013.com.au). These were available for sale for $50 each. 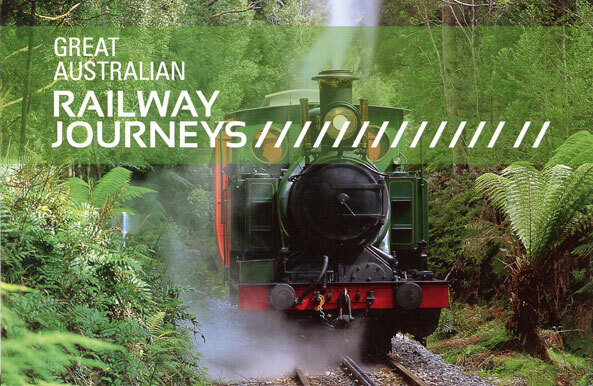 The prestige booklet contains the above four panes, and four postcards showing the trains. Surprisingly the price on the back of the booklet is $12.95, whereas the booklet sells for $10.95. 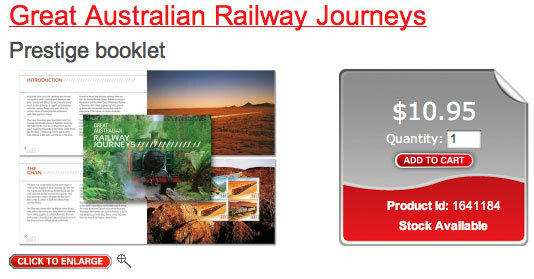 This is the second time a pricing error has occurred on a prestige booklet this year. The imperforate prestige booklet contains four imperforate panes, along with four postcards showing the trains. The booklet was limited to 500, and were individually numbered. Each booklet was overprinted with the Australia 2013 logo. In all other ways these booklets are the same as the regular booklets - same pages, same barcode and same pricing error. This issue included self-adhesive coil and booklet stamps. 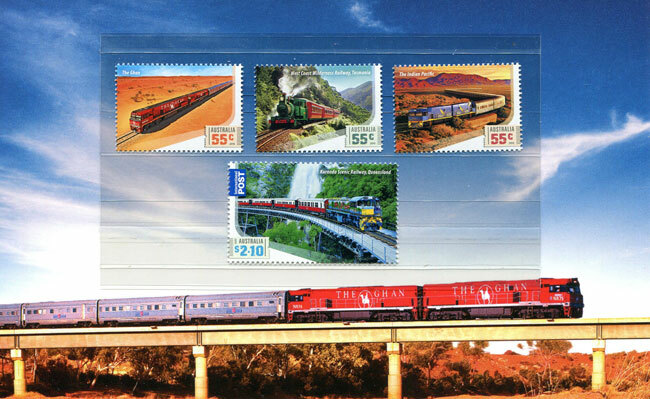 Four booklet stamps were released with this issue. 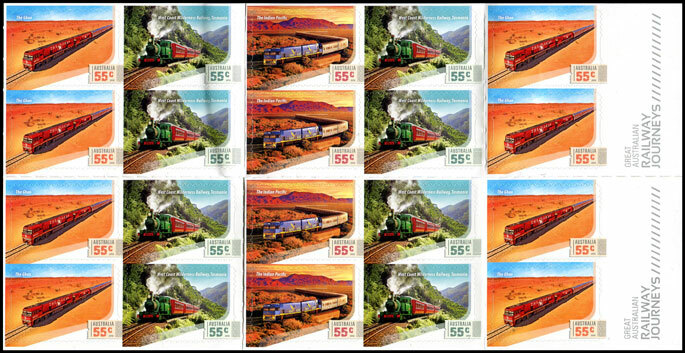 The 55c booklet stamps differ by printer and phosphor tagging. The $2.10 self-adhesive, the first of this size, was only issued in booklets. 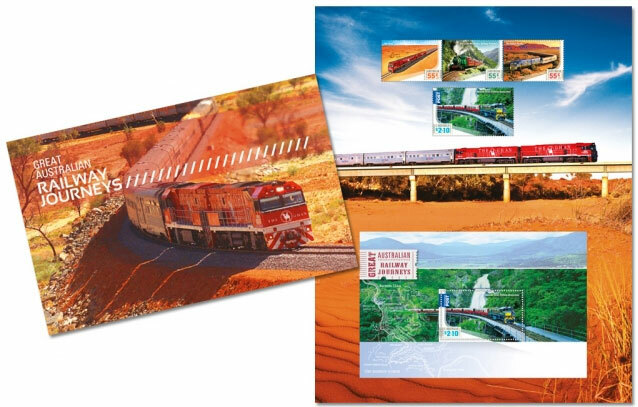 Two self-adhesive booklets were issued. The booklet containing 20 x 55c was rouletted and could be folded up. 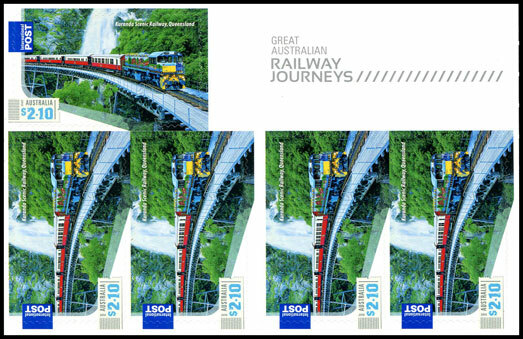 The 5 x $2.10 booklet features a unique layout and was not rouletted, but the booklets could be folded in half without damage to the stamps. 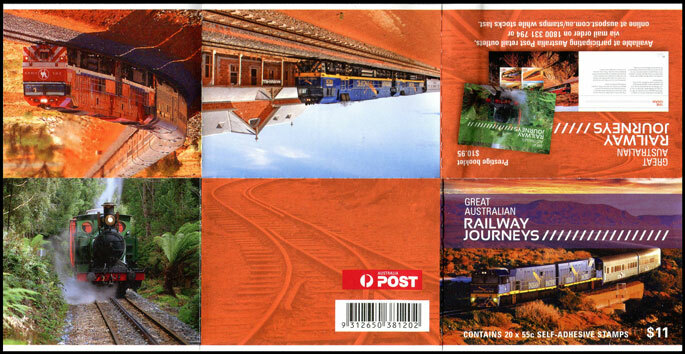 Each booklet was distributed to post offices in chequebooks of 20 booklets. These are not listed on this website. 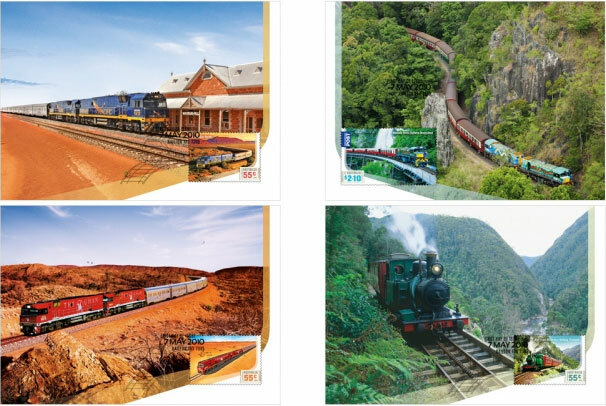 Maximum cards showing photographs of the four trains accompanied this issue. The four postcards in the prestige booklet were not postage paid.